After watching Mum entertain family and friends for years and years I guess I’ve picked up a lot of her habits. One of the things she always like to do was to have everything prepared before people arrived and I’ve followed in her footsteps particularly with desserts. That’s one of the reasons that this recipe appeals to me. It can be made the day before and then just taken out of the fridge when you need it – marvellous. 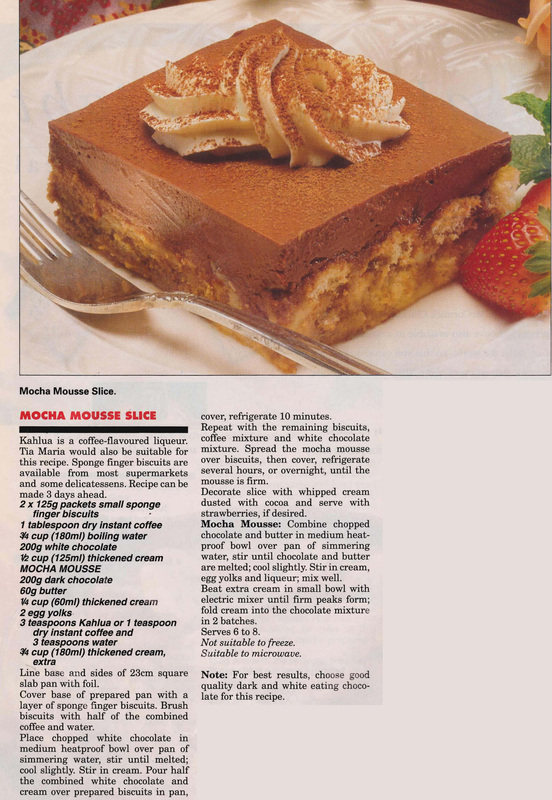 This entry was posted in All Recipes, Desserts and tagged 1990s, chocolate, coffee, cream, Kahlua, mocha mousse slice, sponge fingers, Tia Maria by bebsrecipes. Bookmark the permalink.